We see celebrities, politicians and famous people cruise around with bodyguards to protect themselves and their possessions from various threats. While most of us cannot afford such kind of protection when we cruise the streets, we can at least have that kind of protection when we cruise the internet. I have provided list of 7 powerful Firefox add-ons with screenshots that will protect you from the dangerous unknowns of the internet. When you view a website that is not added to NoScript trusted website, it displays a status bar at the bottom as shown below. In this example, it shows 3 scripts were allowed out of 8 scripts in the website that you are currently viewing. You can allow all or selective scripts from a website by clicking on the NoScript icon in the status bar as shown below. 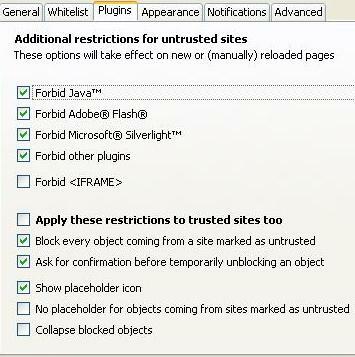 From the NoScript options menu, specify whether you want to block Java, Flash, Silverlight or IFRAME as shown below. The concept behind WOT is good. Before you click on a link, WOT will give you an idea about the site by displaying colored ring icon next to the link – green to go, yellow for caution and red to stop – helping you avoid dangerous sites. If the colored ring next to the link is confusing, an option to enable color blind accessible version is available from WOT menu. In the example below, it displays the WOT ring icon next to the link. 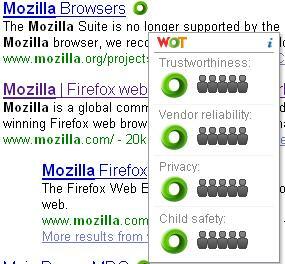 Moving mouse over the ring icon displays the WOT rating in four different categories – Trustworthiness, Vendor reliability, Privacy and Child Safety. The ratings of different sites relies on the user input. If you choose to contribute to the rating, you can create an account at myWOT to rate different sites yourself. Since the rating is driven by user input, the quality of the rating depends on more user involvement. According to mywot.com, they currently have ratings for more than 20 million websites, with more than 1 million dangerous website in their list. If you visit a website considered as dangerous by WOT, it will give you a nice warning message with an option to continue or exit from the website. Also, if you don’t like the ring next to the link on search results, you can turn them off from the WOT option menu. But, you’ll still be warned when you enter a dangerous site. While browsing internet, animated flash contents can be very annoying sometimes. Flash Block blocks all the flash contents by default. 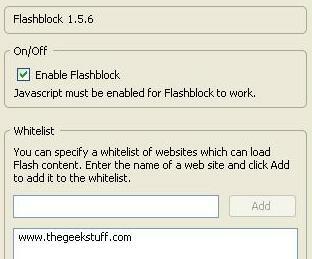 To allow flash from a trusted website, add it to the white list as shown below. When a flash is blocked on a website, it will display an icon with “F”. When you move mouse over the “F” icon, it will turn into “Play” icon, which will let you play the flash on demand. If you use NoScript, you don’t need to install flash block, as NoScript blocks flash content. Location Bar add-on puts emphasis only on the domain name in the address bar for any page that you are viewing. This will help you to easily spot the domain name of the website to avoid any spoofing. In the example below, mozilla.org is emphasized in the address bar. 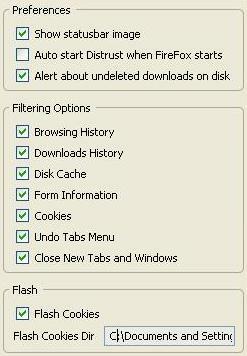 In my opinion, this should’ve been the default behavior of Firefox like Google Chrome browser. Move the mouse to any part of the URL in the location bar and press <Control> + click, which will open the URL until that point in a new tab. In the example below, <Control> + click on “firefox” on the URL will open the URL until Firefox in a new tab. Using InterClue you can view the content of a website from the link without opening the website. 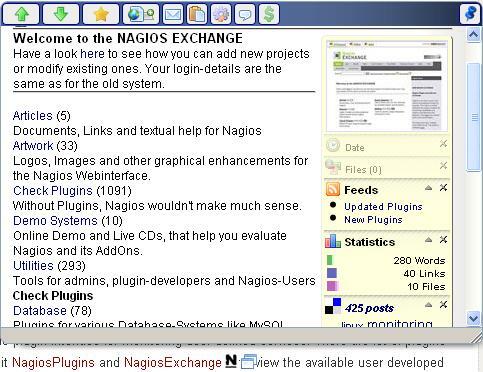 Just move the mouse over the icon that is displayed next to the link, which will open a pop-up to display the content of the website and some other vital statistics of the website as shown below. I prefer InterClue over other preview website add-ons, as InterClue strips down unnecessary formatting of the target website and displays the content in a very nice readable format. From the InterClue option menu, you can configure the link to open only when you click on the icon. I really like this feature, as I don’t like pop-up automatically show up when you accidentally move the mouse over a link. InterClue has lot of options for you to play around and tweak it as shown below. Distrust is very simple and easy to use add-on to browse the internet without leaving a trace on your laptop. Click on the eye icon in the status bar to enable secure browsing mode, where distrust will monitor Firefox for its activities. After turning off distrust, it will remove history, cache and cookies that were used during the distrust session. Following are the different items monitored during the distress session, which can be configured from the options menu as shown below. Hackers use Keylogging technique to monitor and capture the keystrokes you type to obtain sensitive information like your password. KeyScrambler add-on encrypts all the keystroke that you type anywhere in the browser. 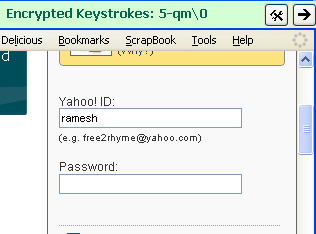 In the example below, as I typed ramesh in the username field, KeyScrambler encrypts it to 5-qm\0. So, if a hacker is using key-logger to monitor your keystroke, he’ll only see the encrypted keystrokes and not the original sensitive information. From the KeyScrambler options menu, you can also hide the keystroke overlay window that is displaying the encrypted keys as you type. 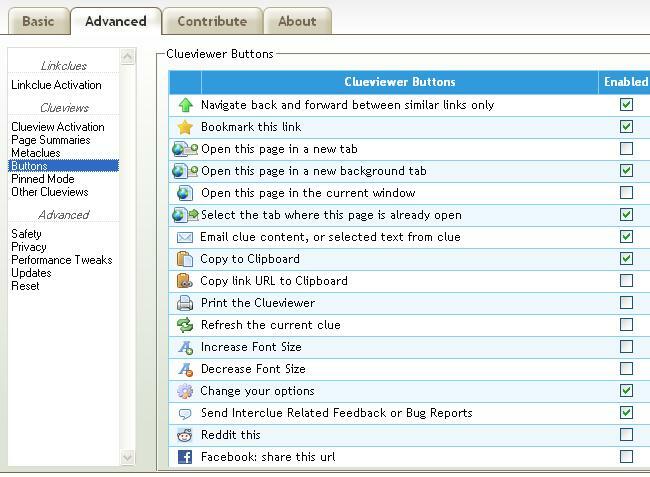 KeyScambler Personal Firefox add-on will only encrypt the keystrokes that you type on Firefox browser and not the keystrokes that you type on different applications. What Firefox add-ons do you use to browse internet securely? Please leave your comment. If you like this article, please share it on del.icio.us and Stumble it. Do you think grease monkey has any security threat? Thank you for including WOT in your 7 Bodyguards list. We are pleased to be included in this strong group. WoT is awesome. I started reading this article and just thought “They’d better include WoT”. You forgot Sandboxie.I use it religiously. 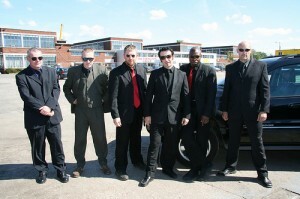 The 7th bodyguard is standing in the middle behind all 6 bodyguards. Thank you for showing me KeyScrambler Personal. I run into keylogger problems commonly, and now I can worry a bit less with it (not to mention stop using the on-screen keyboard to type in passwords). Nice call here. I’ve been using NoScript for about 2 years now, and it’s never let me down. Similar to #7, but I’ve found keepass a bit easier to manage and use. I’ve found Adblock Plus to be helpful in security, as it not only stops the download of various ads, it stops gullible people (young and old alike) from being enticed / tricked into clicking on them. It also cleans up the web a bit. Adblock Plus: Element Hiding Helper cleans up the holes left by ads as well as helping you to block text ads. The less the advertising companies know about me, the better. Hey. I don’t know if you know about these extensions, but they are what I strongly recommend, they go hand in hand with Adblock and especially NoScript. Redirect Remover – Some website like to track where you are going by redirecting you, you may white list websites as needed. Ref Control – Whether you know it or not websites know which website you came from by checking the referrer sent by Firefox, this extension will ensure some privacy, by Spoofing how referrers are sent, using a white list/black list approach. FoxyProxy – If you need a little more privacy you can use a proxy, FoxyProxy comes with some unique features that ease the process of switching proxy settings. both this one and the new one. I find BetterPrivacy and TACO (Targeted Advertising Cookie Opt-Out) fairly useful, as well.